With our Amish 60" Lancaster Mission Single Bathroom Vanity Cabinet, you'll be able to take your bathroom to new heights. Handcrafted with the utmost care in northern Indiana, this piece will become the center of your space as you enjoy its beauty and functionality for years to come. 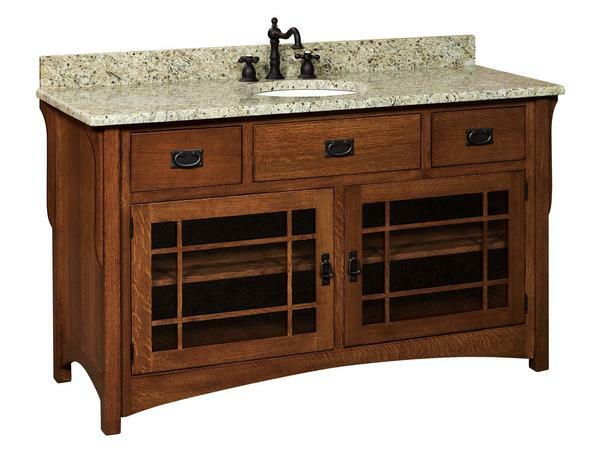 Its gorgeous Mission style features the clean lines that you love and serves to accentuate the grain of the wood that you choose to have your piece constructed in. From oak to walnut to hickory and beyond, you will be able to customize your bathroom vanity cabinet to your heart's desire. All of our hardwood selections are solid and handpicked from North America, ensuring lastability. Spacious storage can be found in this piece's two usable drawers, as well as an ample cabinet space that is accented with unique crossed mullions. This detail on the glass door of the cabinets is a lovely touch that makes this vanity memorable. Enjoy classic Mission style furniture made with the care of expert Amish woodworkers. For details on making the perfect choice of vanity for your bathroom, be sure to check out the DutchCrafters blog for helpful tips.